In good polish, a Shinshinto Shobu Zukuri Wakizashi, signed Bitchu no Kami Tachibana Yasuhiro in ShiraSaya. There were three generations of (Settsu) Yasuhiro, two were very high ranking. Normally they would include a Kiku mon, as they were entitled, but this blade has none. So it is either an early, pre-Kiku award blade, or possibly a tribute blade made by another smith; we suspect it was made by one of the 3 true / original generations because it is exceptionally high quality. The blade has virtually no ware (just one tiny forging "wriggle" line) and a tiny twin fukure (carbon spot / blister); absolutely nothing in comparison with most blades. Plus the Mokume Hada (grain) is absolutely superb. 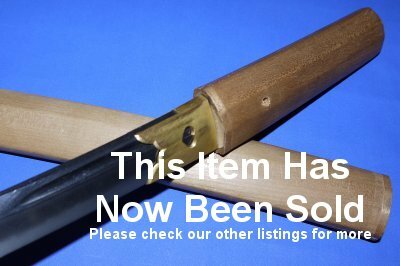 Despite the fact we believe this blade was made by a master, we are selling it as a high quality wakizashi in very good condition and priced accordingly, but we suspect this could we be the bargain of a lifetime for someone. The 17 5/16 inch cutting edge (Nagasa) blade is in very good condition. There are a couple of patina spots but we believe nothing major. The shira saya appears to be quite old and is coming apart a little at the seams; we glued tsuka (handle) back together. A truly lovely blade. A real investment at £1200. Please quote item reference AE23. Further / full sized images upon request. Box 0715-82 (1.423). Smiths signing "bitchu no kami tachibana yasuhiro"